"What is truth?" Pilate asked. Then he went out again to the people and told them, "[Jesus] is not guilty of any crime. 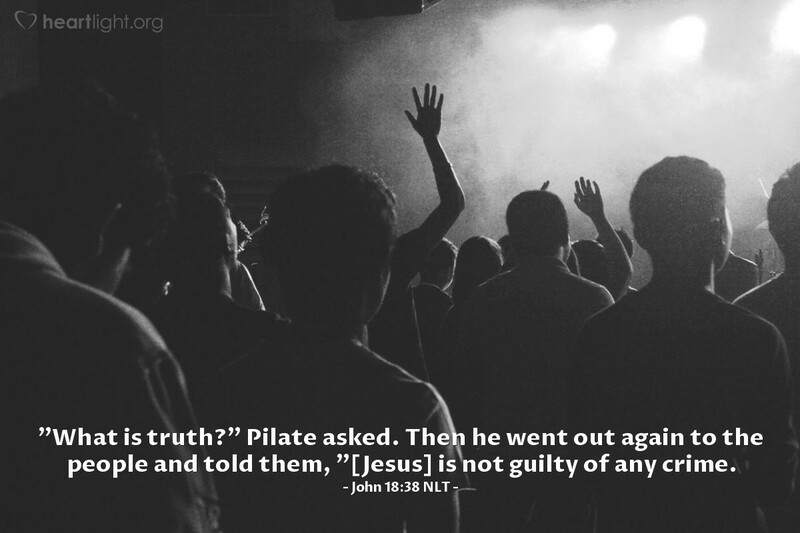 Pilate answered his own question: Jesus was not guilty of any crime. The whole process is a great reminder of the travesty of injustice and the loss of human decency and integrity. Jesus was delivered into the hands of those who hated him. The Messiah was convicted on trumped up charges in an illegal trial. Jesus was rejected by people crying for his death while trying not to defile themselves ceremonially. The true King was rejected by those who were supposed to be God's chosen people, but they cried out that they have no king but Caesar. People who should have been committed to righteousness put the Lord to death and set a murderous criminal free, as recorded in the next verses. So, when you feel mistreated, please remember the Lord. If you feel abandoned ... betrayed ... and unjustly punished, remember Jesus. Then understand that he went through what he faced so that you could know the truth and the truth could set you free! If you have Jesus, you have everything, and no one can take him away from you. That's the truth! Righteous and triumphant God, King of the nations, thank you for the triumph that is mine in Jesus. I know your truth is liberating. I know your truth is powerful. Please give me the courage to trust that word and build my life upon it. In Jesus' name, I pray. Amen.